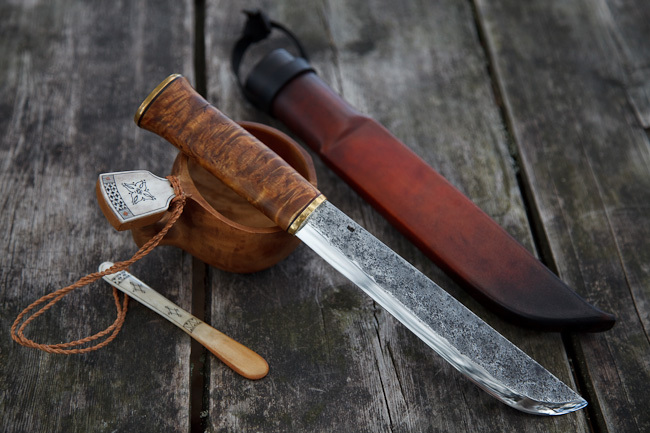 The leuku is a traditional knife of the Sami culture of Lappland, it is also called “stuorra niibi” which means big knife. I will be making two posts about the leuku, the first one with a brief description, some photos and an account of his experience with the leuku by Thomas (edgepal) from Northern Sweden. The second post is an excellent essay written by Pasi Hurtilla, a puukkoseppä from Ivalo, Finland. The leuku is a multi purpose tool. There are several smiths making leukus and they are available from some of the manufacturers of Nordic knives such as Strømeng. They are popular for use among those who like to hike and camp in the forests, “bushcrafting” as well as the reindeer herders.